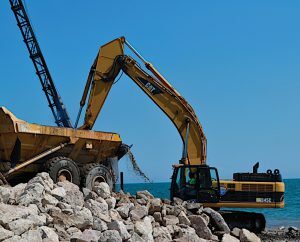 Chris Buckman, vice president of corporate construction at BMWC Constructors Inc., says Northwest Indiana has strong industrial and highway infrastructure arenas. The company has offices across the country, including in Indianapolis and Northwest Indiana as well as Ohio and Washington. “These two industries provide consistent opportunities that allow for a strong supply of skilled construction resources,” he says. “Commercial construction provides opportunities as well, but it is the ongoing maintenance and capital improvement opportunities of the industrial sector and ongoing highway infrastructure initiatives that really make the difference for Northwest Indiana by creating a consistent demand for construction services. Organizations are working to keep the pipeline of workers filled through promotion of construction careers. Rich Gamblin, apprenticeship coordinator for Ironworkers Local #395, says attending career fairs is an avenue to showcase the industry. Comerford says CAF also works closely with area schools and colleges to spotlight the areas within the construction field. “We visit dozens of schools annually and talk to hundreds of students about the career opportunities in construction,” he says. “The CAF also coordinates several field trips every year. These are typically for high school counselors and high school building trade students. In order to fill this gap, Buckman says the industry could benefit from an image update. “Construction careers offer unbelievable opportunities, but unfortunately, our industry has struggled with an identity crisis as a large number of folks [who are] looking for a career see construction as less sophisticated and not as attractive as other industries,” he says. “The reality is that a large number of owners of construction companies started as workers in the field. Comerford also sees how views of the industry can make it more challenging to attract workers. “I think the younger generation views the industry as old-fashioned and not very dynamic,” he says. “I don’t think that the average high school student understands the sheer variety of careers that exist in the construction industry. Clarida finds that engaging the next generation requires a shift in tactics because time on smartphones and video game systems has replaced playing outside. “The world has changed so much,” he says. “We need to get kids who like to work with their hands and have some mechanical aptitude and an inquisitiveness. 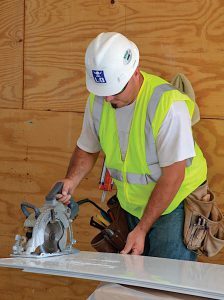 Gamblin adds that it is important to highlight the reality of life as a construction worker while connecting with interested individuals. 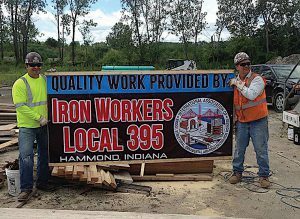 GOOD WORKERS Ironworkers Local #395 helps young people understand what it takes to succeed in the construction industry. Programs such as Helmets to Hardhats, Veterans in Piping and Indiana Plan seek to spur veterans and minorities down the construction career path. 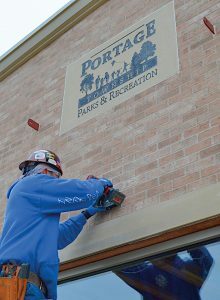 “We work closely with several veterans groups to help the men and women who have served our country find gainful employment within the construction industry,” Comerford says. Proper initial training and apprenticeship programs keep the workforce strong and safe. 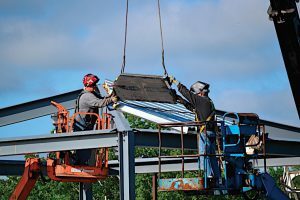 The ironworkers’ four-year comprehensive apprenticeship program blends job training and classroom/shop hours. “We also offer onsite Ivy Tech college courses that fold into the ironworking classes and training that culminates in an associate’s degree of applied science,” Gamblin says. After graduation, maintaining elevated skill sets is required for a solid labor force in the region. Larson says the industry is becoming more regulated with specific safety requirements, task training, drug testing, background checks and equipment operating certifications. CAF provides opportunities for professional development and training in such areas as project management and bidding procedures. It also has the Construction Safety Institute, which provides a platform for workers to learn safety tactics in a hands-on way. Gamblin says adaptability and planning are key aspects to the industry’s continued growth and development. “Most of our work is in maintenance and with advancements in technology and the steel mills downsizing, the construction industry has had to adapt,” he says. “The changing face of construction does affect our apprentices and journeymen, but we have been preparing and planning for these circumstances. Buckman says the industry will only continue to benefit from companies and organizations working together to foster continued learning. Before launching her freelance writing career, Lesly Bailey spent 11 years in the newsroom as a copy editor and page designer. She focused on state, national and world news as well as obituaries during her time at the Seymour Tribune, Columbus (Ind.) Republic and Times of Northwest Indiana. It wasn’t until leaving behind the world of hard news that she embarked on her writing career. She has been a correspondent for the Times and its magazines and publications as well as a community coordinator for its Facebook sites. Today, she also serves as a marketing consultant for the Northwest Indiana Small Business Development Center and Porter County Aging and Community Services. She has had the opportunity to share many region entrepreneurs’ stories and she continues to be inspired by their hard work, dedication and passion.